See this item in eBay's new look for this page. Buyer pays shipping. I will find out the cost of freight to any location in the world, and the cost will have to be included with the payment prior to shipping. Use Anything Points at PayPal! Learn more. Note: This is a Reserve Auction in which the reserve price was not met. Therefore, there is no transaction between the seller and the high bidder. Since there is no transaction, this item is not eligible for eBay services that protect buyers and sellers, such as transactional feedback, escrow or insurance. Those services are available only for items listed, bought and sold on eBay in compliance with our guidelines and policies. 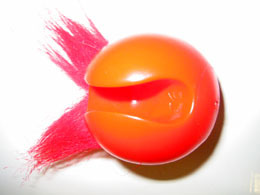 This auction is for one poor example of a red nose, as produced for BBC's red nose day 2003. This is what the back looks like. It will surely fit any small to medium size human nose. 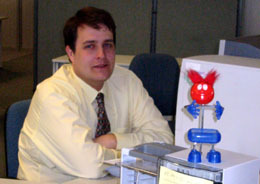 Here is a picture of the red nose with it's friend Nigel Blinman. The nose is equipped with arms and legs courtesy of a mobile phone holder, which unfortunately is not included in the auction. 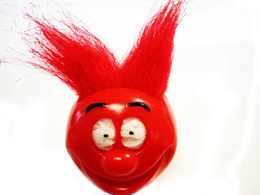 Secretly though Nigel isn't really the red nose's friend. Look what he did to it with his size 12! 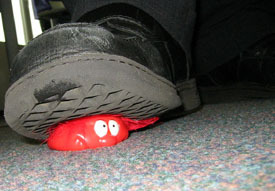 For more information on the environment in which this red nose currently flourishes, visit blinman.com. This tribute site contains rants and observations about people's stupidity and lists many things that Nigel hates in an amusing manner.